I was thinking about what to write for my next blog and seeing that New Year’s Eve was soon to be upon me I thought about what I would like to do to make 2014 a memorable year in my life. We had a very interesting discussion at our Zen book study this morning and several of us shared stories from the past about how we had hurt or been hurt by others in our lives and how we dealt with those hurts in the past and what we could do in the future with those memories, thoughts, or actions. It reminded me of a book that I am reading now with a most intriguing title: If You’re Lucky, Your Heart Will Break, Field Notes from a Zen Life by James Ishmael Ford. Part III of his book is entitled “Talking the Talk, Walking the Walk.” It made me think about 2013 and if I just talked the talk, spouted the platitudes and Zen teachings in a rote manner without really living them, and what that may have done to my life, and to those who had the misfortune or fortune to pass through it with me. So it does not matter whether I make the list or not—what does matter is that I practice the art of being mindful of my thoughts and words and the actions that follow. What matters is that in 2014 I live a life that exemplifies the Buddhist moral discipline part of the Eightfold Path: Right Speech, Right Action, and Right Livelihood. For me that means continuing to be an active part of our Zendo (Southern Palm Zen Group), my prison ministry, my work with Enroll America to help everyone get signed up for healthcare, and being cognoscente of the thoughts that I think, the words that I speak, and the actions that I take. I can only do that when I focus on being mindful in body, mind, and spirit each and every moment of each and every day. I know it is a large goal, but it is one that will help me achieve my 2014 life goal: making it memorable. I want it to be something I will be proud of when 2015 rolls around. So if you see me and I am not particularly expressing right speech, right action or right livelihood please let me know and bring me back to my 2014 goal: making the year memorable. And I mean memorable in a good way, NOT a bad way for you and/or for me. I’ll need your help with that, that’s for sure! I learned long ago that I cannot do it alone, but I can do it with everyone’s help—especially yours. I hope you’ll catch me talking the talk AND walking the walk! Yesterday was December 7, 2013 Pearl Harbor Day a fortuitous day in American History and a day of silent meditation for those who lost loved ones on both sides of the sea. 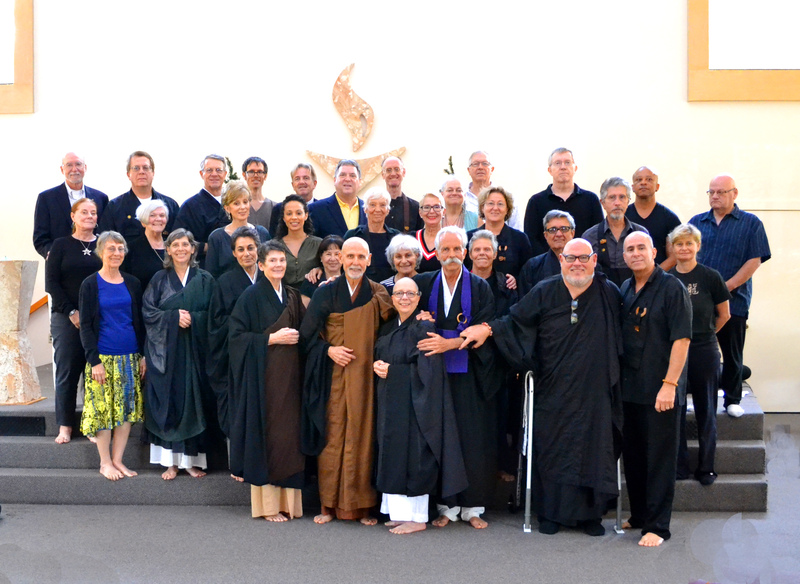 I remembered them all as I was moving through my ordination as a Zen Buddhist priest/monk with the Southern Palm Zen Group in Boca Raton, FL. December 8th is traditionally the day Buddhists focus on as the day of “awakening” when Shakyamuni Buddha (Siddhartha Gautama) saw all existence as it really was. After meditating for 45 days while sitting under the Bodhi tree he is to have said, “I and all beings on earth together attain enlightenment at the same time.” And thus we are all the Buddha. This Buddhist teaching was beautifully woven into the ceremony by my teacher and guide Doshin Sensei. As I looked around I saw the room filled with beautiful Buddha’s of all ages, sizes, shapes, and minds. How wonderful is that! As the ceremony moved slowly forward I was able to take the time to focus on the principles of Buddhism that I was now officially taking into my life. I am ever grateful for my teachers, friends, and family members who were there in body and/or spirit who give me multiple opportunities in this life to test my ability to live these precepts and practice outwardly their meaning and ultimately their effects in my life and the lives of all those with whom I come in contact. I pray each day that when I encounter you, old friend or new, that I see you as you truly are the Buddha incarnate in mind, body, and spirit, and that I treat you as such. In the end of the ceremony Doshin and Mushin dedicated this beautiful song by Tchaikovsky, ” My genius, my angel, my friend” to me. I though you might like to know the words. My angel, my genius, my friend! And flying quietly around like a light shadow? The picture below is a shot of all those who attended the Tokudo Ceremony minus the photographer my dear friend, Chip, who gives me multiple opportunities to walk my talk. Wow, for me this is a very difficult thing to do. I have opinions about everything and live my life usually from one side, the left, and the philosophy of Emerson and Thoreau’s Walden Pond. One of my favorite pieces by Emerson was his graduation talk at Harvard that got him kicked out and was not to be invited back to the campus for many, many years. So it is a challenge for me to be able to do as Okumura says, “become free from both perspectives and simply be in the middle (reality).” But when we use mindfulness and meditation as a center for our lives it can become easier and easier each day. My friend Dan Huston, has written a wonderful book that is being used in colleges to teach a different kind of communication skills, Communicating Mindfully, Mindfulness-Based Communication and Emotional Intelligence. He writes about a young student of his who found an opportunity to use what he taught her—merging mindfulness and communication skills—during a speech that one of her classmates was giving on a subject that she held the opposite view point. The techniques worked and after the class she was able to have a very serious but mindful conversation with her classmate. “That is an important distinction because mindfulness meditation is not about picking and choosing what we want; it is about accepting the reality of each and every moment and making a distinction between what is really happening in those circumstances and what we layer on top of it with our reactions—in this case, the circumstances of her reality were growing potentially hostile because of the addition of Jill’s [the speaker] anger and frustration. Fortunately, she [the listener and mindfulness communication student] was able to recognize those feelings as they emerged. She accepted them but did not encourage them with self-talk that could have fueled the fire within her; consequently, those emotions were not allowed to grow in intensity. She noticed them, and let them go (page 239). Remember what Okamura said: To let go of thought means to become free from both perspectives and simply be in the middle (reality). So the next time you get the opportunity to listen remind yourself of what Stahl and Goldstein recommend in their mindfulness training manual A Mindfulness-Based Stress Reduction Workbook, “We all want to be heard. It’s essential to feeling understood, accepted, and loved. When we sense that others are truly listening, our fears and defenses tend to fade away, paving the way for greater connection, empathy, and peace in the relationship (page 164).” And it helps us live the middle (reality) way—without loss, without gain! 1. I will begin listening in the “middle way” to everyone I meet. 2. I will remind myself that doing this can help me create greater connections, empathy and peace in all of my relationships.